ERP SOLUTION Story off BC Software Services Pvt. Ltd.
ERP I.e. Enterprise Resource planning is centralized framework for all data and process of an organization. It integrates all aspects of a business organization from planning to inventory, manufacturing, sales, marketing, finance, customer service and human resources. At BC Software Services Pvt. Ltd. we provide cost effective customize ERP solution that, we can demand, fulfill every clients requirement. Our expert team is dedicated to develop complete and fully customize ERP Solution. Our main aim is to develop which will be non-conventional software. Now, when the time become shorter and shorter but competition becomes more and more acute, any organization can’t run properly or can’t compete with other organization without powerful ERP software. So usability of this software is gaining more and more popularity. 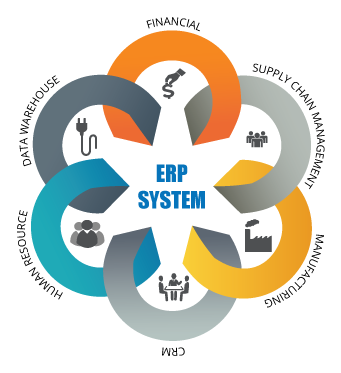 A business organization that may big or small need a powerful ERP software. But problem is that not many companies develop low cost ERP software. So we are the best choice for the small organization. Before developing software we think what is the actual need of the clients, then we think why they demand like so, finally we think how it can be solved exactly according to the clients demand. An ERP software developing is not the last word, its support is main thing. We have a very active team to give our best support.